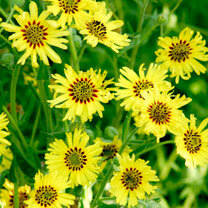 Tropical scented bright yellow flowers with contrasting maroon central rings and attractive grey/green foliage. The flowers are even more fragrant in the morning and evening. Robust, easy to grow plants. Flowers late June-September. Height 70-80cm (27-31"); spread 20-30cm (8-12"). Tropical scented, bright yellow flowers with contrasting maroon central rings. Step into the garden and breathe in the scent of summer. Caribbean Daisy’s bright yellow flowers smell just like tropical fruit, so they’re perfect for growing close to a pathway or a window so that you can enjoy the fragrance. GROWING - Sow in pots or trays and place on a windowsill or propagator at 15-21ºC. Do not exclude light. When large enough to handle, transfer to individual pots and grow on in good light. Acclimatise to outside conditions and plant out 40cm (16") apart. Ideal for beds and borders, raised beds. Scented. Attractive to bees. Prefers full sun. HINT: Perfect to grow by a door or window, allowing you to appreciate the fruity fragrance.